Delivery in transportation box with compliance certificate. B 100 S - latest and lightest model of the series. The switch is designed for the pushing by index finger. Being a detachable instrument the metalloscope B 100 S could be easy repaired in case of its damage after the fall. Resistant to shocks. Delivery in transportation box with compliance certificate. Similar to B 100 S, B 300 S. Cast design, non-separable. Encased in plastic body, the electrical loop is reliably protected. Only the cable and switch are changeable. The use of B 300 S is preferable when there is a probability of contact with water/steam or any other liquids. B 310 - the most small-sized metalloscope of the series. Reliable protection because of cast design and plastic body. The set of equipment "Nomade" would allow you the carrying out of easy and safe inspection in situations when the use (and handling) of cumbrous power units (and fuel for them) and tens of meters of cable is inevitable. Spare power supply (battery), designed for 3 hours of continuous magnetization - time for the standard inspection. 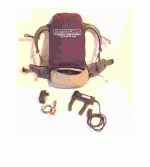 (The battery is easy changeable and rechargeable over one night). The charger is part of delivery. Converter, supplying the alternating voltage to power compact metalloscopes (series 100, 300 and 310 including inductive lamp Y400 by request of the client). Most powerful metalloscopes of the series. DA 200 S equipped with comfortable handle, reducing to the minimum the load on the hand. The powerful magnetic circuit makes possible the use of the instrument when working with large-sized objects or heavy alloys in production conditions. Detachable design of the instrument makes easier its maintenance. The switch is designed for the pushing by first finger. Metalloscopes are equipped with comfortable handle, reducing to the minimum the load on the hand, which is important at the long-term usage. Encased into the removable shell, this makes possible the repair in case of its fall. Such metalloscopes are in great demand at institutions, rendering meteorological services. Brand new: analyzer of magnetic field with function of graphical information display; shows on the screen characteristics of magnetization, menus of inspection. This instrument is mostly designed for the use in aircraft industry as it reflects the authentic maximum values. For the measurement of tangential and residual fields. Delivery in transportation box with metrological certificate and last certificate according to NFX 7011 & 010. 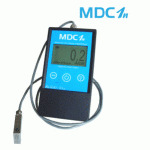 This instrument is adequate analogue of MDC1 being always in demand, which is used in metalworking and nuclear industries. Wide matrix display and big figures with backlight facilitate the reading; easy-to-handle when measuring both the tangential and the residual magnetic field. The instrument is supplied together with direct or bent probe, especially for the options of residual field measurement. Scale +/- 20 degrees, zero mark in the middle of the scale. This instrument is an indicator but not a measuring instrument Delivery without certificate. Permanent magnet with undischargeable poles from Nd and boron bearing iron, 150 mm long, poles are connected by metal wire 300 mm long. Delivery in special transportation case. Lifting force > 30 kg. The body is made of aluminium and plastics. Permanent magnet with undischargeable poles from Nd and boron bearing iron, 150 mm long, poles are connected by metal wire 300 mm long. Delivery in special transportation case. Lifting force > 40 kg. Diameter of poles 40mm. The body is made of aluminium and plastics. Wire section allows the use of extensions 60 m long for 48V and 30 m long for 24V. 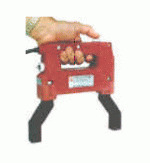 Extensions for A48, D48, A448, B48, B142 are supplied with adapted plugs and sockets. The wire section allows the use of extension 60 m long for 48 V and 30 m long for 24 V.